In the past few posts, we have painted this rosy picture of the evolution of the Polis, making it look like the Greeks awakened from their barbarism to quickly become enlightened and philosophical. The actual path leading to the golden age was not that smooth, however, and had many bumps in the road. The Age of Tyrants is one of the more interesting detours, lasting through the second half of the Archaic Period from the time of Cypselus in 650 B.C. to the end of the reign of Hippias in 510. Tyrants sprang up around the Aegean including Athens, Corinth, Megara, Samos, Naxos, Miletus, and Sicyon. 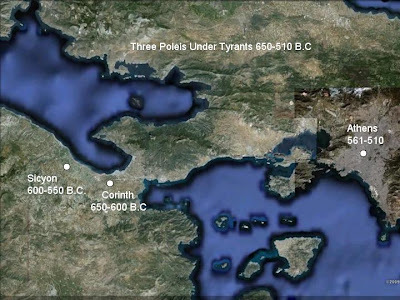 This post will look at three of them from Greece proper: Corinth, Sicyon, and Athens. Corinth was one of the leading commercial cities in Greece when the unpopular and cruel Bacchiadae aristocracy was overthrown by the tyrant Cypselus in 650 B.C. This was the purest form of liberation, and Cypselus had such a high level of support from the people, that he never needed a bodyguard. He ruled Corinth in a benevolent way for thirty years, and was succeeded by his son Periander, who ruled ruthlessley until 582 B.C. when he was over thrown and an aristocratic Polis restored. Sicyon was located near the northern coast of the Peloponnese between Corinth and Achaea. After the Dorian invasion, it was divided into three Dorian tribes and one Ionian tribe, which remained subject to Argos for some centuries. In 600 B.C, a tyrant named Cleisthenes rose to power and instituted an anti-Dorian policy. he ruled for forty years. His successor, Aeschines, was expelled by the Spartans in 556 who made Sicyon part of the Peloponnesian League. Finally, there is the case of Athens and Peisistratos. As army commander in the Megaran conflict of 567 B.C, Peisistratus gained popularity in Athens, but did not have the political support to seize power so he staged an attempt on his own life, and in the chaos that followed, persuaded the Athenian Assembly to issue him bodyguards. Peisistratus, like his predecessor, Cylon of Athens, used his bodyguard to capture and hold the Acropolis. Peisistratus was ousted from political office and exiled twice during his reign. The first occurrence happened circa 555 B.C. after two political factions, normally at odds with each other, joined forces and removed him from power. He was exiled for several years, returned to power for a time, and then was exiled again. After ten years he returned in force, regained his tyranny, and held his power until his death in 527 B.C. Hippias succeeded his father in 527 BC, and with his brother Hipparchus, ruled jointly until the latter was murdered by Harmodius and Aristogeiton (the Tyrannicides) in 514 BC. Hippias executed the Tyrannicides and became a bitter and cruel ruler. The exiled Alcmaeonid family helped to depose the Athenian tyranny for good by bribing the Delphic oracle to tell the Spartans to liberate Athens, which they did in 510 BC. Why did these tyrants appear? As we have discussed before, the early Poleis were generally controlled by an aristocracy in a delicate political balance with the common people. As people will do, the aristocracies tended to become more oppressive, leading to popular support for someone who could take power on their behalf. These tyrannies attempted to continue as hereditary models but failed because of uneven governance. The failure of class balance is evidence that the early Poleis did not have enough democracy in them to create long term stability, which would come later. These cases demand an alternate definition of the word “tyrant” which generally carries a negative connotation. The Greek examples often involved benevolent leaders who improved the conditions in their Polis and/or championed the rights of the lower class rather than being power hungry and destructive. In addition to the ‘natural order’ aspects of ancient societies those tyrants perpetuated, the populous were often happy to create a strong leader with absolute power, in times of danger and warfare. Protection being the traditional role assumed by the elite. Your right Geoff. Look at the Romans and their "emergency" dictator office.